Flying cars, self-cleaning houses, moon bases, and video magazines. Popular science promised these things for 50 years, and finally one has arrived. In the September 18th issue of Entertainment Weekly and in the New York and LA markets, CBS and Pepsi will be running a joint ad that features a tiny video screen. That screen, only a few square inches in area, will run montages, ads, and previews when the magazine insert is opened. It could be a colossal flop or the wave of the future. Check out a sample version of the screen from its manufacturer, Americhip, in the video below. That tiny screen is going to show you commercials in your magazine. Be prepared. Americhip’s thin filter crystal LCD screen is less than 3 millimeters thick, but can run for 65 to 70 minutes and contain more than 40 minutes of footage (depending on the model). Content can be added and the screen recharged via a mini-USB. While the screen turns on automatically when the page is opened, users can control what videos they see by pushing on five different buttons. 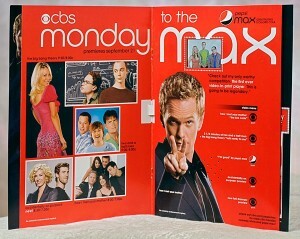 CBS and Pepsi are hoping to use the innovative advertising strategy to highlight their “Monday to the Max” campaign. This shared marketing focuses on CBS’ new fall line-up and Pepsi’s Pepsi Max product, which will be featured heavily in that schedule’s commercials. Look, I’m not a huge fan of advertising (except for ads shown on our website, every one of which is amazing and perfect), and some of this stinks of desperation. CBS has advertised on eggs, deli meat wrappers, grocery store doors, and who knows what else. I’m also old enough to remember Pepsi’s Crystal Pepsi campaign as well. I wish I wasn’t. Part of me shudders to think what would happen if either of these guys got a hold of a building-sized projector. That’s just a matter of time though. The digital and physical worlds are colliding together at prodigious speeds. As video screens get smaller and cheaper, they can appear almost anywhere. Audio equipment has already started to do this. Have you noticed how singing birthday cards are getting thinner and cheaper? The digital media that we’ve come to expect to be restricted to certain devices is poised to invade the physical world at large. Soon, even the most intimate portions of our lives could be augmented by digital information, displays, and interactions. So maybe it’s a bit of a surprise that I think this latest ad gimmick will be more flop than wave. While we’re all addicted to purchasing anything we see on a TV, the costs for this sort of campaign seem to be prohibitive – an undisclosed amount, likely to be in the millions. CBS and Pepsi may get a lot of traction with it because they are the first to break ground, but unless the costs of hardware and magazine ad space plummets, advertisers are likely to focus on getting many people to view one phenomena (like a wall-sized ad). Eventually I think advertisers have to realize that giving every person a little TV is redundant. Many of us already have them. Smart phones and iPods are everywhere, and the bigger market, perhaps the scarier future, is getting ads into that medium. Many are already there. As interesting as people may find a video magazine, a well-planned viral video on the Internet could reach a much larger audience at a fraction of the cost. Sorry 1950s, this idea’s probably a bust. Maybe we’ll have better luck with flying cars.